Our Fresh Scotch Bonnet Pepper Pods are Made Fresh from the Worlds Finest Fresh Scotch Bonnet Chili Peppers, also known as Boabs Bonnet, Fesh Scotty Bons, Fesh Bonney peppers, or Fresh Caribbean red peppers is a variety of chili pepper. Found mainly in the Caribbean islands. Most Fresh Scotch Bonnet Pepper Pods have a heat rating of 350,000 Scoville Units. These Fresh Scotch Bonnet Pepper Pods are used to flavour many different dishes and cuisines worldwide and are often used in hot sauces and condiments. 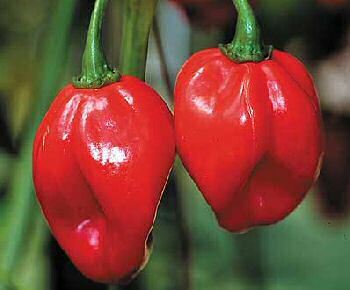 The Fresh Scotch Bonnet Pepper Pod has a sweeter flavour and stouter shape, distinct from its fresh habanero cousin with which it is often confused, and gives jerk dishes (pork/chicken) and other Caribbean dishes their unique flavour. Fresh Scotch Bonnets are mostly used in West African, Grenadian, Trinidadian, Jamaican, Barbadian, Guyanese, Surinamese, Haitian and Caymanian cuisine and pepper sauces, though they often show up in other Caribbean recipes. Try our Fresh Scotch Bonnet Pepper Pods Today!